Since the Steam release is going to have support for different resolutions, I’m replacing a lot of the bitmaps used in the game with bigger ones. The current filesize is 137MB, which obviously wouldn’t work for a web game. I’ve also implemented cloud saving now. All of your .meow files will be backed up when you exit the game, and re-downloaded when you start it (if they need to be), no matter where you are. 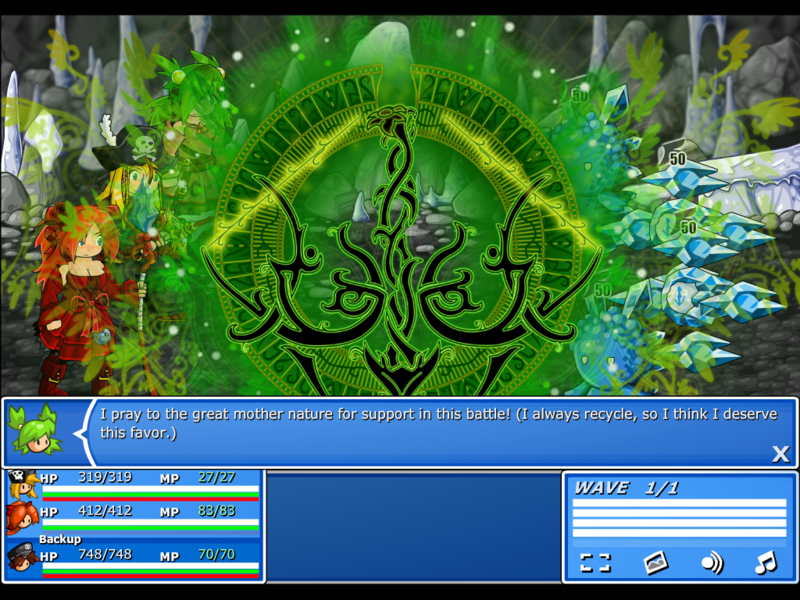 Also there’s a fullscreen button in battle now. After this, most of the remaining stuff just involves preparing the Steam store page. I’ll have to update the screenshots and trailer to show off some of the new content too. Oh yeah, I also need to implement the save game transfer. It will probably involve moving your .sol file into a very specific folder, and giving it a specific name. The game will check for that file and convert it into a .meow file, overwriting the auto-save slot. Not very user-friendly, but I’ll post a walkthrough somewhere. 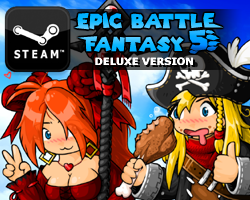 This entry was posted in Epic Battle Fantasy 4, Game News on February 16, 2014 by Matt Roszak. Definitely can’t wait, keep up the amazing work. I’ll be sure to grab it ASAP once its finished and up on Steam. Nope. No plans on updating the walkthrough ever. Wow. Much wow. Very amaze. Superlative quality! im confused by ur post. 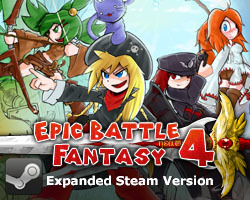 so is EBF4 released yet? if yes, i cant find it. if no, will you inform us when you do? does the steam version also have the same amount of save slot or will there be more? If you know where the file is, you could write a a small program (kinda like an install wizard) that would search in that directory for that .sol file. After you find it, you then write a new .meow file in the steam cloud directory and transcribe the data from the .sol file there (however you plan on doing it). Of course if there is no file you’d have to throw an exception (perhaps ask if the user could browse for it if the program can’t find it?). Sorry, Flash neither AIR may search directories for files automatically. This would require Matt to write a batch (.bat) file for Windows, a Linux command for Linux and a separate weird thing for Apple OS/2. The only way is to, indeed, write a step-by-step documentation on how to locate and copy-paste the correct file. It will require testing on different platforms, though. It will require knowledge of where shared objects are created on different operation systems, and how are URI addresses specified on different OSes. It will also require compiling the entire game using AIR SDK instead of normal Flash Professional (the versions which can’t export for AIR) or only Flex SDK. I’m sorry I’ll go wipe myself from the face of the Earth for being dumb and useless. To be fair I had zero idea on how flash/air stores data (all I know is that I was able to get some off my hard drive one time matt asked for some files). Also I should have been a bit more specific I was thinking of a small seperate application written in Java (or C#, Python, or whatever). My bad. Ah well No plan survives contact with the enemy and it’s still a learning experience! Whelp it’s Mac AND Windows so I stand corrected there! I’m not using Air. But the issue with .sol files is that a .swf file can only use one specific directory for them. They’re not supposed to be moved around. I can do whatever I want with other files though, because they’re manipulated through the .exe wrapper, and not from the .swf. EBF, fullscreen, in 2560×1440 res? I think I’m gonna die of witnessing the awesomeness. I’m literally so excited for this. Will you be offering the soundtrack as a stand-alone purchase, or will it be bundled with the game? Also, do ya think ye might just be able to get some steam cards for this? If so, lvl5 EBF4 badge; here I come. Thank you so much Matt for all of your hard work and diligence. I know that thousands of people are extremely grateful for all that you do. And easy on the fanservice, Natz gives us enough! It’ll only go up to around 720p, because I don’t think Flash could handle anything higher. We might bundle the soundtrack in with the game, not sure yet. And yes, the cards are already made. I thought you were making the extensions alone. What is the resolution of all the textures? I’m using one of those fancy IPS Korean monitors at 1440p and I’m a bit worried the game might be a bit too fuzzy full screen. It’ll only go up to around 720p. While playing at Kongregate I usually “upscale” it to almost full-screen (1920×1080), and it looks great. Will there be a native support of that resolution in the Steam-version ? I dunno, that’s pretty high. Very few people would be able to run that with high settings. Just to be sure – how EBF4 will work on full-screen with full-hd-resolution (or any resolution higher than 720p)? Will it be placed at the center of the screen with black border or will it be somehow “upscaled” to fit the screen ? It’ll be upscaled to fill the screen. But it’s not a widescreen game, so it’ll have some borders at the sides. The quality looks epic !